"These gluten-free crackers are made with garbanzo bean flour, sorghum flour, and rice bran. 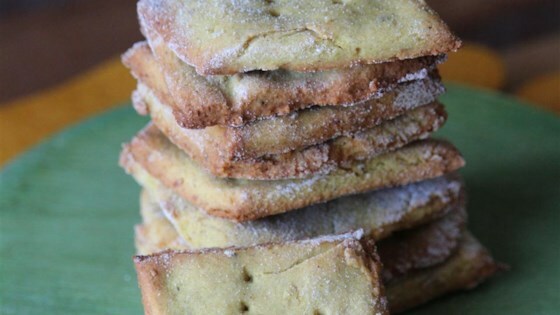 I needed to develop a cracker with ingredients I had on hand, and these worked!" Mix garbanzo bean flour, sorghum flour, rice bran, water, Italian seasoning, vegetable oil, baking powder, honey, and salt together in a bowl until smooth dough forms, adding more garbanzo bean flour as needed to roll. Place dough on work surface between 2 sheets of parchment paper. Roll dough out to 1/8-inch thickness using a rolling pin. Remove top layer of parchment paper; cut dough using a 2-inch biscuit cutter and place 2 inches apart on prepared baking sheet. Bake in the preheated oven until golden brown, about 10 minutes. See how to make Chef John's Flax Seed Crackers. These are not crispy, but they will hold a dip!